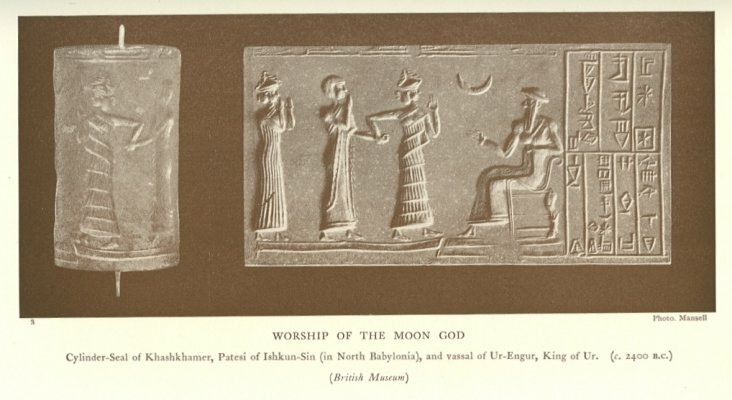 original 1915 caption: "Worship of the Moon God. Cylinder-seal of Khashkhamer, patesi of Ishkun-Sin (in North Babylonia), and vassal of Ur-Engur, king of Ur (c. 2400 BC) (British Museum). Photo: Mansell"
Fuente Donald A. Mackenzie, Myths of Babylonia and Assyria (1915), p. 50 , Messrs. Mansell & Co.
An artistic work other than a photograph (e.g. a painting), which was made available to the public (e.g. by publication or display at an exhibition) more than 70 years ago (before 1 January 1949). This tag can be used only when the author cannot be ascertained by reasonable enquiry. If you wish to rely on it, please specify in the image description the research you have carried out to find who the author was. The above is all subject to any overriding Publication right which may exist. In practice, Publication right will often override the first of the bullet points listed. Unpublished anonymous paintings remain in copyright until at least 1 January 2040. This tag does not apply to engravings or musical works. More information. A este archivo se le ha extraído la siguiente imagen: File:Ur-Nammu (cropped).jpg. "Ur-Nammu, the mighty hero, king of Ur; Ḫašḫamer, patesi of Iškun-Sin, his servant."